A new buzzword has entered the executive corridors: Enterprise IoT. Within the last five years, new terms have emerged, reflecting the digitalization of the physical world through a growing base of connected devices, transmitting data through the greater use of connectivity technologies, and ultimately, with rapid developments in innovative applications, transforming that data into actionable insights. 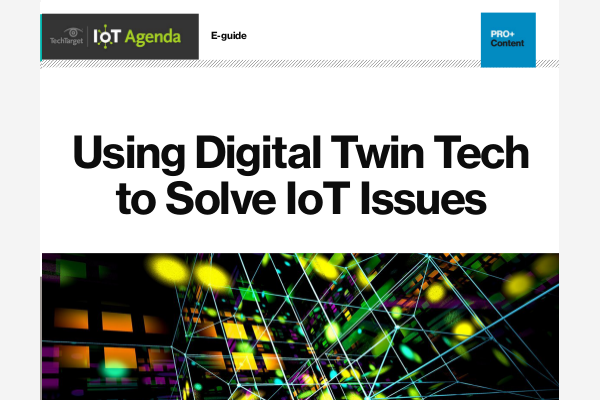 M2M, IoT, big data, Industrial IoT and now Enterprise IoT are closely related terms in this new digital world. For the enterprise with products, services and processes supported by enterprise-wide systems such as ERP, CRM and SCM solutions to name a few, the objective has extended itself from optimizing the processes around production and distribution to optimizing the products and services themselves through their “connectedness.” In conjunction, bringing a closer integration between operational technology (OT) and information technology (IT) has emerged as recent technology changes in process improvements. In many ways, supporting IT technologies has moved from the back-office to the front-office. A few examples illustrate these developments. Manufacturers of home security systems such as FrontPoint, Vivint and ADT or air-conditioning units by GE, LG, Carrier and Maytag have long focused on the quality of their products — and how greater efficiencies and performance could be achieved. With these units connected and sharing data, not only are enterprises able to monitor and manage the performance and condition of these machines, but also use and learn from the data about the predicted condition of the machines, the behaviors of the users and, in combination with other information sources, how power may be better managed in the home or how additional features in security devices can help detect other possible incidents and activities at home such as water leakage, entry to specific areas or cupboards, and/or forgot-to-turn-off the cooker solutions. For enterprises designing and launching these new products and services, Enterprise IoT has enabled many new opportunities. At the industrial level, the monitoring and management of equipment such as pipelines, presses, extruders and assembly lines have all benefitted from M2M and Industrial IoT. The goal of automated systems — substantially more efficient and productive — provides significant benefits for many enterprises, and the convergence of operational technologies (the IT behind and within operational equipment) is becoming less and less discernible from back-end information technologies. As one example, operations within virtual power plants from, say, Schneider Electric now illustrate this convergence of OT and IT, operations tightly integrated with energy trading systems and energy storage facilities, all managed through OT & IT integrations. 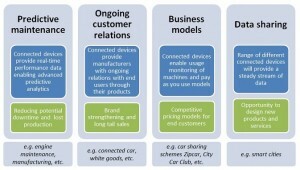 As products generate and provide data about their performance, usage and, in many cases, their physical environments, enterprises have started to transform their industries, processes and relations with customers in what has been termed as “servitization.” In a nutshell, servitization is the process by which traditional manufacturing companies have started to transform their industries from pure product-oriented production and distribution processes to significantly greater focus on opportunities in service-led processes. These service-led opportunities can be identified in four key areas as illustrated below. Enterprise IoT is about connecting devices and monitoring and managing the processes in an intelligent way. It is also about “transformational business outcomes,” (part of the definition of Industrial IoT by the Industrial Internet Consortium), and these transformations are driven by new business models with new processes such as billing, customer services and data sharing. And inherent to all these transformations are the new and real-time integrations to enterprise systems, moving from the back-office to the front-office with the assistance of cloud services, APIs and OT & IT integrations. So what does Enterprise IoT mean? 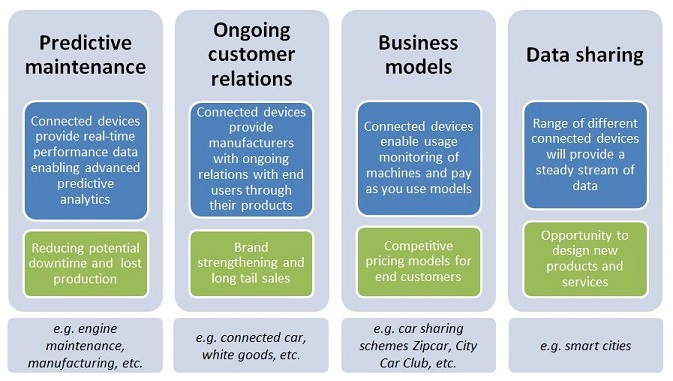 Enterprise IoT is not just another technology enablement step in terms of connecting devices, a new platform or application, or some new analytics. It is all of that plus the significant opportunities that emerge for enterprises in creating new and innovative processes around their products and services. Enterprise IoT extends not only the technology enablement landscape within the enterprise, it has firmly started to disrupt many traditional manufacturing industries with new service propositions and created new expectations and relations with customers.